I just received my Secret Santa Swap package! Kris was my swap partner. 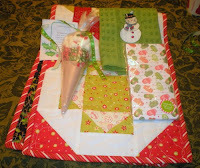 She made this beautiful Christmas tablerunner, the embroidered snowman towel, Christmas cocoa and a cute notepad to go along with everything. Thank you so much Kris for these AWESOME gifts!